So if you've followed my blog then you'll know I'm a big fan of H&M - their clothes are good quality and I love the simplistic designs and colours. So I think that's a good enough excuse to put together a Summery post. Today we are on the subject of 'tank tops' or 'singlets' as H&M call them! I got into an obsession with striped clothing last year and nearly 3/4 of my closet is striped clothing from either H&M, River Island or Primark. I'm not ashamed and love stripes! It might be out of fashion or 'not it' at the moment but I don't care. Okay so I chose another striped top - can you blame me? This is a longer size and probably would look like a skirt on me but I like the look of it. It would go well with a pair of shorts and a pool and a cocktail in hand. I like these two shades and think they go well together. The addition of the little surfer adds a cool effect to it. Even though I'll never use the little pocket - it still looks good. I don't normally choose tops like this - I prefer simple, striped or blocked colours and I'm not really interested in slogans or anything. But I saw this one and liked the colour effect and the picture. I think it would really good with a pair of shorts and some flip flops. 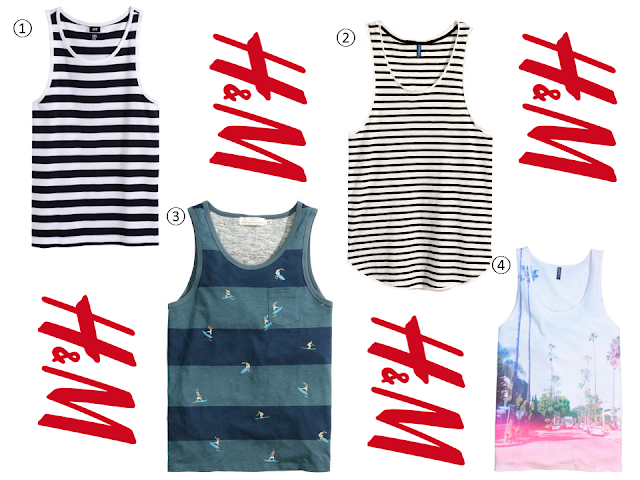 Let me know what you think - have you had a look at H&M's new Summer items? There is some really good stuff!